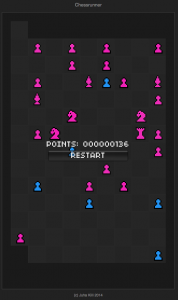 Yesterday, my friend Lloyd linked me to Chessrunner (reddit thread), a web-based, chess-inspired endless runner in which you start with only a king, which you have to move forward on an endless chessboard. As you move, you can capture enemy pieces and make them your own. It’s an inspired idea, and one that apparently only took developer/creator Juha Kiili a weekend to implement (in Unity). There has been plenty of positive commentary on Reddit, and hopefully he’ll flush out the idea and (ideally, IMO), bring it to iOS. 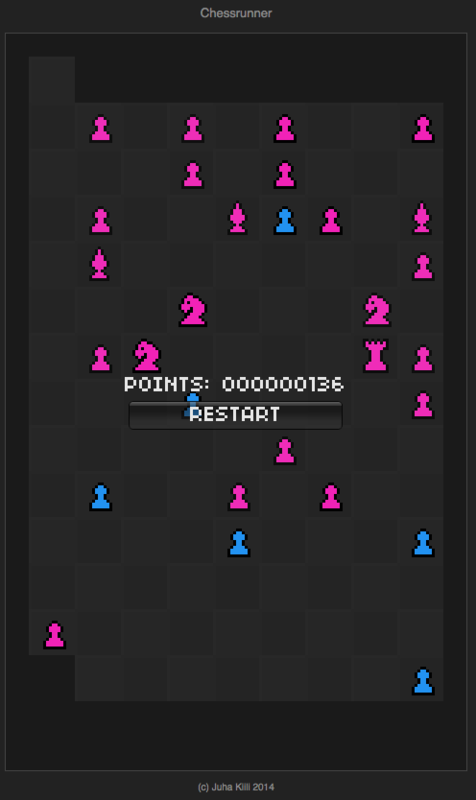 Chessrunner’s “timer” mechanic (making it an action puzzle game) is pretty cool in that the gameboard is both expanded (from the top) and shrunk (at the bottom) one square at a time. The opposing colored pieces take one move after every one of your moves. They will ALWAYS capture your king if you give them opportunity, but they are not smart enough to trap you (yet), so surviving is really all about seeing all the attack lines. And that’s why this game really does a good job (IMO) of feeling like something you do while playing chess. Pawn’d (available for $1 on iOS, or in Lite form for free) is a chess & match-3 matchup. 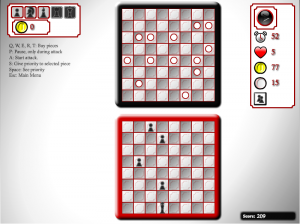 I had a very similar design idea for this style of game as a game mode for ActionChess, but I never really put any time into it. Pawn’d takes the concept in a lot of different directions at once, and looks great while doing it. 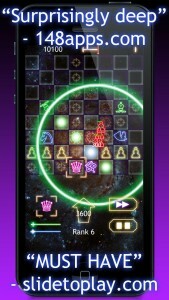 There are three main game modes, each designed around how the game ends, and each with two more difficult variations called “Blitz” and “Master”. Additionally, there are two introductory modes that have neither variation, one called “Practice’d” (play to a certain # of matches), and another called “Clock’d” (play to a time limit). Each of the modes has its own leaderboards, making something like 22 leaderboards in the whole app. There are also a ton of achievements. Basically, if you like this concept, you can keep playing it for a LONG time without running out of things to do. This game, possibly more than any of the other ones listed here, is decidedly worth playing, and I’ll cop to getting sucked back into it while writing this. I’m fond of telling the story about how, when asked what he thought of ActionChess, my (then 8-year old) nephew Jake replied with “Could you make it a tower defense game?” I LOL’d. Well I think it was less than a year later that you could play Chess Tower Defense over on Kongregate. It’s graphic design is quite spartan, but the concept is interesting nonetheless. You must survive waves of attacking “things”. (They are not pieces really.) The things don’t attack your pieces, but instead march methodically toward you (downward), passing right through your pawns. Your pawns (and other pieces) can attack them, in the standard directions, and if they don’t, each thing will remove one of your hearts when it gets past your back row. Between waves, you can reposition your pieces, and buy new ones. It’s an interesting concept, and one also worth spending some time playing, if only just to wrap your head around it, I think. Knight Defense (for iPhone or iPad) appeared in the app store about another year or so later. As good as Knight Defense looks, it’s definitely less on the chess strategy end of the spectrum, and closer to the tower defense end. It’s all real-time, so there is no turn based aspect, and you can move your pieces all over the board at will during the game. 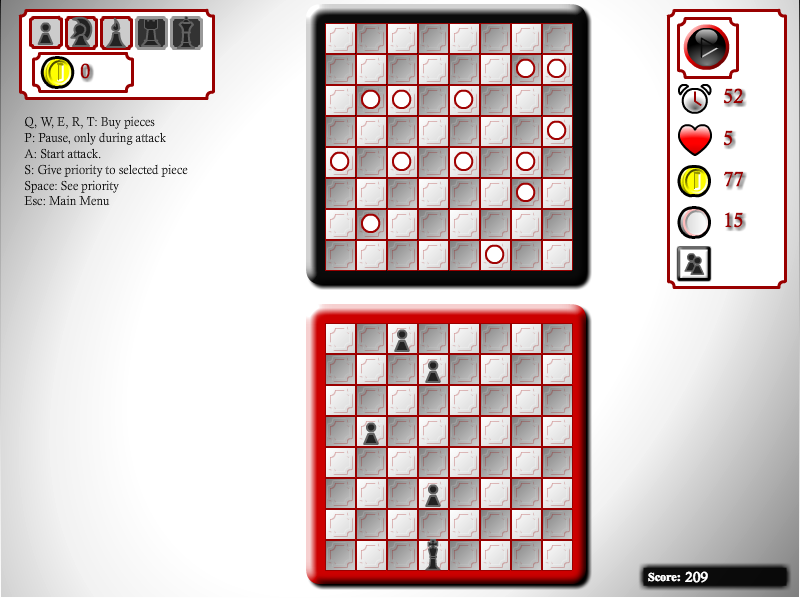 In each of the squares your pieces could attack in a real game of chess, those pieces may damage enemy pieces. 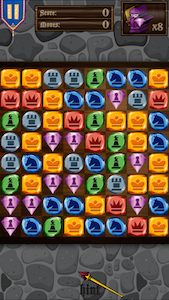 Like other tower defense games, Knight Defense is played in waves, during which enemies will appear at the top of the screen and move toward your king piece, wherever he might be on the gameboard. Though they are shaped like chess pieces, the enemies don’t move or attack like chess pieces, there just run into whichever of your pieces are in front of them, and “damage” them, eventually destroying them. Your pieces can be upgraded to do more damage at once, and to heal them once they’ve themselves been damaged. This is worth playing for chess fans, (especially so for those of you who already enjoy Tower Defense), but it’s not necessarily at the top of my list. 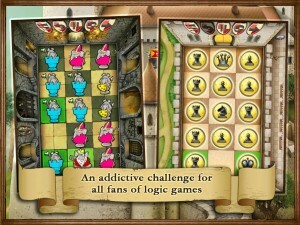 Cheesy Chess (free with ads for iOS) is not turn-based or action-puzzle at all. 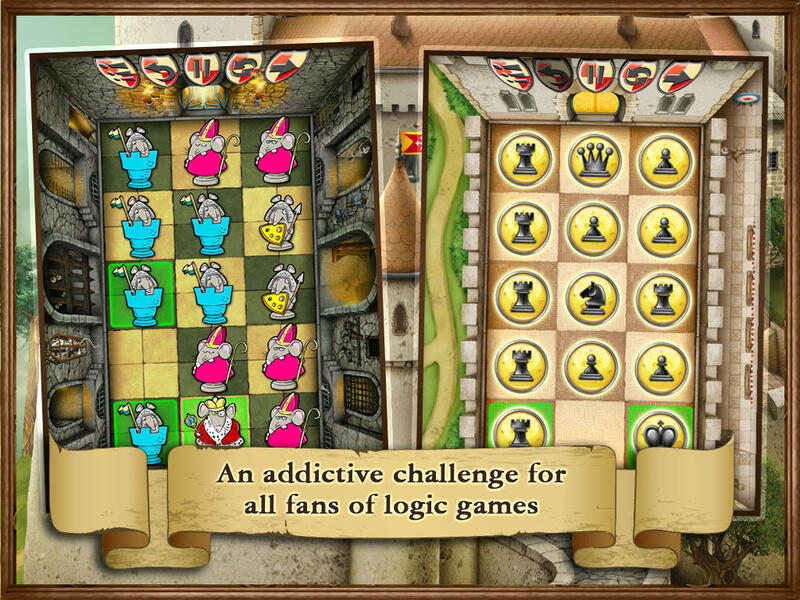 It’s more of a static puzzle game where the goal of each level is to get your king to the other side of a small chess board filled with pieces but for one square. In as much of the game as I’ve seen, there were no captures, only moving pieces around in a very cramped and crowded grid. This felt to me like a chess-themed version of Rush Hour (a sliding block game). Admittedly, I’ve played the least of this game. The mouse chess theme is super cute though, and it’s very well-made.